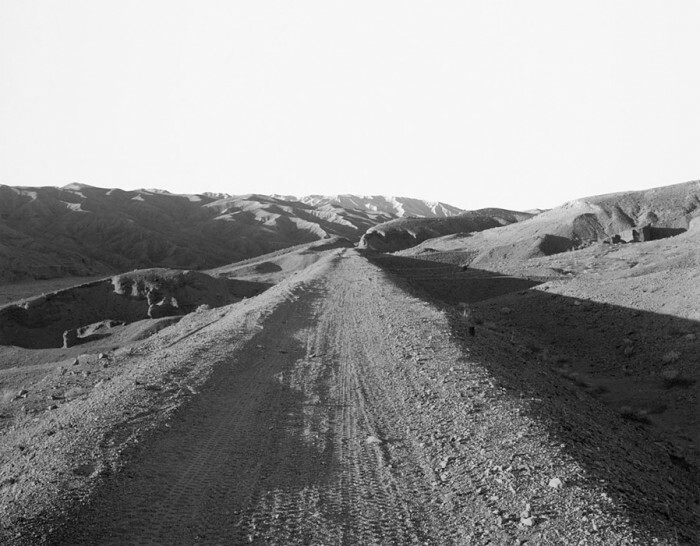 Yossi Milo Gallery is pleased to announce an exhibition of black-and-white photographs by Mark Ruwedel. The exhibition, entitled Westward the Course of Empire , will open on Thursday, February 5 and close on Saturday, March 7, with a reception and book signing by the artist on Thursday, February 5 from 6:00 to 8:00 pm. This will be the artist’s first solo exhibition in New York. Mark Ruwedel photographs the sites of 19th and 20th century railway lines in the American and Canadian West using a large-format view camera. The collapsed tunnels, deteriorating trestles, and eroding cuts and grades of over 130 abandoned railroad lines are documented in photographs taken between 1994 and 2006. The detailed gelatin silver prints record the remains and ruins of railway networks, as well as evidence of industries that moved in after the decline of the railroad, such as uranium-claim markers, mine entrances, and bomb craters at abandoned army fields. In the tradition of the New Topographics, Mr. Ruwedel acts as an archivist, cataloging the effects of past usage on the current landscape. The titles of the images, faintly hand-lettered in graphite directly on the mount by the artist, name the defunct rail lines, evoking both place and destination, such as “Carson and Colorado” or “Tonopah and Tidewater”. By echoing the photographic surveys and topographical studies done during the growth of the railroad enterprise, the project serves as a coda to the rise and impact of the railroad and industry on the forgotten terrain of the West. Mark Ruwedel was born in Bethlehem, Pennsylvania in 1954. His photographs are held in numerous collections, including Yale University Art Gallery, New Haven, CT; The J. Paul Getty Museum, Los Angeles; Los Angeles County Museum of Art; U.S. Library of Congress, Washington, DC; Fonds Nationale d’Art Contemporain, Paris; Metropolitan Museum of Art, New York; San Francisco Museum of Modern Art; and the Stedelijk Museum, Amsterdam. The book Westward The Course of Empire was published by Yale University Art Gallery in 2008. Mr. Ruwedel currently teaches at California State University, Long Beach, CA.